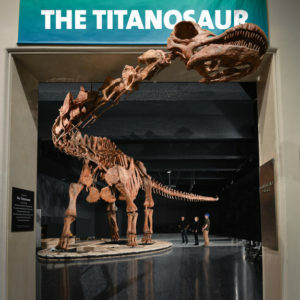 This post will start out a bit differently because I want you to understand how amazing titanosaurs are before getting into the news about them. The titanosaurs were the largest land animals ever to have lived (around 100 tons). Blue whales are heavier (around 180 tons) than the titanosaurs were, but the whale’s weight is supported by the ocean they live in. Titanosaurs had to support their weight all on their own. For comparison, an African elephant (the largest land animal alive today) weight 7 tons. 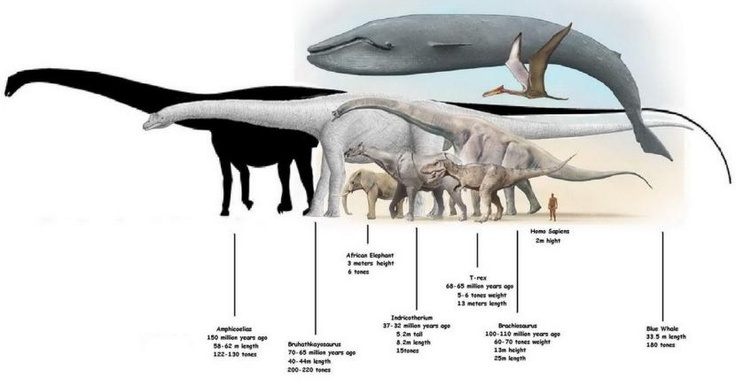 So a titanosaur weighs the same as 14 elephants. Titanosaurs belong to the group of sauropod (long-necked) dinosaurs, which are found throughout the Mesozoic. The titanosaurs were the last group of sauropods, from 90-66 million years ago. So the largest dinosaurs were around at the very end of the Mesozoic. Stomping around and causing a big rumpus everywhere they went. How did they get so big?? Good question! Saurischian dinosaurs, including the sauropods and theropods, developed a system of air-sacs in their body. We know this because when the air sacs were big enough, they started invading near by bone and leaving hollow spaces. These air sacs connected to the lungs and created a one-way system of respiration that is super efficient. Birds still rely on this system today. Simple animation of how a bird breathes. Take from here. Compared to a mammal breathing. Taken from here. Ok, so, titanosaurs are: 1) from the Cretaceous, 2) incredibly large, 3) can breathe really efficiently (probably true for all sauropods). A couple of other cool things about sauropods: some of them had [whip tails], some of them had [armor], some of them became dwarf-sized on [islands]. In short, titanosaurs are really amazing. This week (April 2016), two articles were published about titanosaurs! 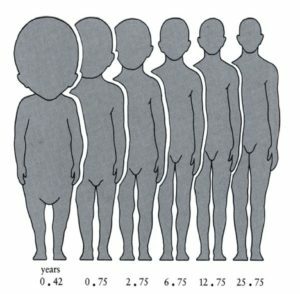 Our bodies change shape as we get bigger. Taken from here. 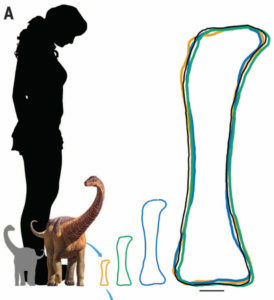 Figure 1A from the paper showing how the baby bones (yellow, green, blue) have the same shape as the adult bone (black). The smallest grey titanosaur is just hatched, the colored one is the size of the specimen they had for the paper. Second, an almost complete skull of the new titanosaur (from Argentina!) 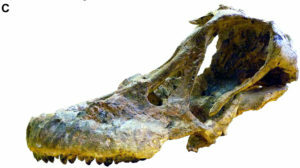 Sarmientosaurus musacchioi was [described]. It was found near the town of Sarmiento, Chubut. It’s so well preserved that the authors were able to CT scan it and create an endocast (a representation of the brain and surrounding structures). 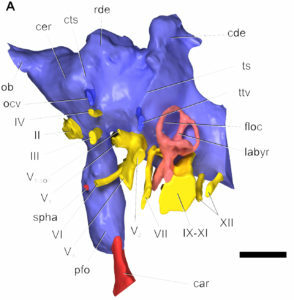 Figure 9a from the paper – a reconstructed 3d brain (front is to the left) showing all the structures. They were also able to use it to analyze the evolutionary relationships of titanosaurs. They ran the analysis several ways and found the same result each time: that Sarmientosaurus is an early member of the most derived titanosaurs, the Lithostrotia. The age of the rocks where Sarmientosaurus is found is older than other members of this group and makes their evolution older than what we had previously thought. The age, evolutionary position, and great preservation of this new titanosaur helps answer many questions about the evolution of the most derived titanosaurs. It’s a spectacular discovery and addition to our knowledge of the largest land animals that ever lived. The AMNH titanosaur in all its glory. Sometimes we find fossils that we can’t quite compare to living animals. We can get a rough idea of what kind of animal they are and maybe what they might have eaten, but the details are unknown. Sometimes it’s because we don’t have enough of the animal’s body parts, but sometimes it’s because they are different from anything alive today. The animal Kolponomos is like that. From the shape of its head, we knew it was related to the group Carnivora. Carnivorans include dogs, foxes, cats, bears, seals, sea lions, walruses, weasels, skunks, otters, hyenas, mongooses, and a few other animals, that eat other animals. 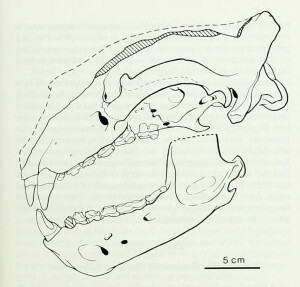 Drawing of a Kolponomos skull done by C. Tarka and L. Meeker at the AMNH. 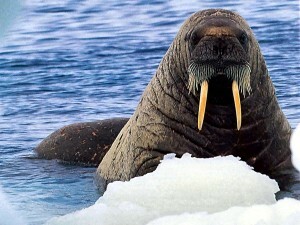 Walruses also eat hard-shelled ocean creatures like clams by sucking the shell until it opens and eating the delicious insides. Scientists couldn’t figure out how Kolponomos was eating these things, until this article came out in Proceedings of the Royal Society B. The authors tested how strong the skull was and how it moved while it bit down. They found that Kolponomos would dive into the ocean, support its head using its lower front teeth, clamp down on the clam, and twist it off the rock using its strong neck muscles. Then it would move the clam to its molars where it would be crushed open. An interesting point about this is that sabre-tooth cats, like Smilodon would use the same method of supporting its head using its lower front teeth to drive its sabres into its prey. 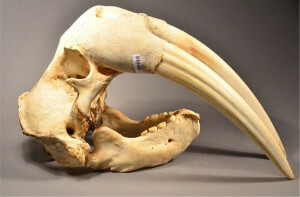 So Kolponomos is a bear-relative, with a diet like an otter or walrus, with a bite like a sabre-tooth, that lived by the ocean. Probably not in a pineapple though.